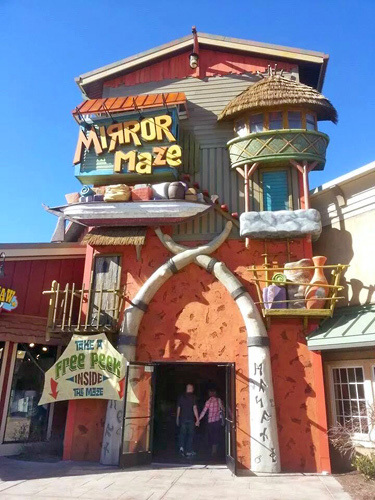 A unique 3,000-square-foot attraction featured at The Island entertainment district in Pigeon Forge, The Island Mirror Maze offers a mind-blowing experience the whole family can enjoy. The thoughtfully designed maze challenges visitors to escape its many psychedelic reflections, dead ends, continuous circles and more—all while wearing effect-intensifying kaleidoscope glasses. Kaleidoscope glasses intensifies mirror effect. Located at The Island in Pigeon Forge. Re-entry allowed on same day. Pass includes Laser Tag and Atomic Rush attraction. Get Stranded. Come be a part of a family’s adventure long ago on a tropical island where a weekend at sea journey turned into a much longer adventure. Shipwrecked and without a means off the Island, the Campbell and McManus families had to improvise. You will explore fun areas of the island that the stranded kids discovered themselves. While the Dads built tree houses to sleep in and a swinging bridge to get to the rest of the island, the kids were out exploring the mystical island. They discovered caves with long tunnels, twisting and turning, that created hiding places in every direction. They also found a strange ancient ruins – that they were certain were more recently used for hiding treasures. ALL NEW FOR 2016 BUMPER CARS! Come bump and bash your family and friends - all in good fun of course! We have the latest in Bumper Car Technology including LED underlighting! 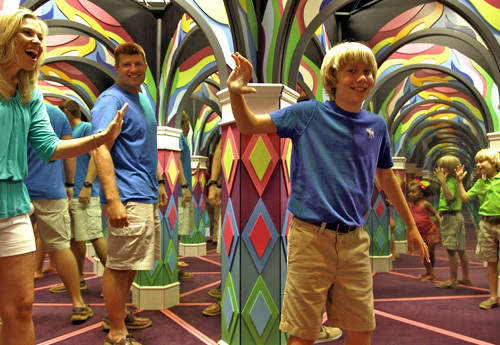 The Island Mirror Maze is a unique, new attraction the entire family can enjoy! At over 3,000 square feet, the mirror maze’s infinite reflections, surprising corners, dead ends and continuous circles will challenge you! It's a truly, mind-bending experience for all ages. Our kaleidoscope glasses will intensify the effects of the dazzling rainbow lights that will confuse and render you utterly lost. After traversing your way through the mirror maze, try your luck at the Laser Maze challenge. Enter the Laser Maze where you must artfully navigate your way through a web of security beams to accomplish your mission. Will your time be good enough to earn you a position in the coveted Top Ten scores? Test your abilities with four different skill levels, and master the maze! If the mazes have completely disoriented you, take a break and challenge the family in the high octane Atomic Rush. It's Simon Says meets High Tech Family Fun in a state-of-the-art arena. 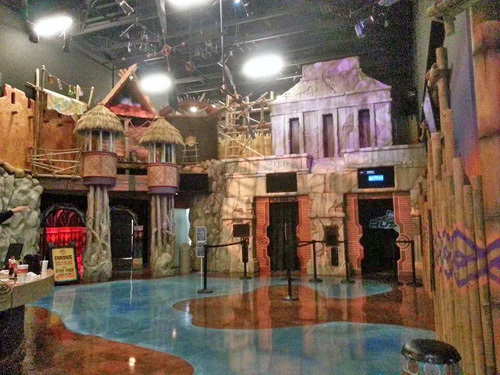 Compete with family and friends with one of three crazy games offered by this brand new, one of a kind attraction. Who has the best skills to scramble and achieve the highest score? Come embark on this family adventure on the mysterious Island! All activities offered at one low price! We open daily at 10:00 AM. Yes. Parents — please accompany your children throughout the entire attraction. There are moments of brief darkness and loud noises. Are there age restrictions for the mirror maze? No. We simply ask that parents accompany their children. Children under the age of 3 may enter the mirror maze free of charge.